JPMorgan CEO Jamie Dimon provides shareholders high-level details about the employee healthcare venture the company is undertaking with Amazon and Berkshire Hathaway. He notes that “high deductibles have barely worked” to improve costs and outcomes. Judging from these and prior comments, Dimon seems to be much less knowledgeable and motivated than Bezos and Buffett and his leg of the stool is the weak one with the most to lose from disrupting the status quo. I wouldn’t necessarily assume that his description of the plan is how it will play out, nor would I rule out Amazon and Berkshire going individually further than the combined venture. From Not from Monterey: “Re: GE exiting health IT. Does that mean that existing GE/IDX customers will now be dealing with Veritas Capital rather than GE? If so, what does that mean for the future of GE/IDX?” I would expect Veritas to create a new company and name for its acquisition like they did with the Thomson Reuters business (renaming it Truven Health Analytics). GE will surely want its name off everything and Veritas probably has equal but different incentive to downplay the GE connection (every year it’s GE Healthcare and Allscripts vying for “worst vendor” in the HISsies voting). I don’t see much future for the aging, GE-mismanaged product line, so I’m assuming Veritas will just milk the maintenance fees until everybody transitions off the products. The one bright spot is the former API Healthcare, which GE has had only four years to screw up. If I were Veritas, I’d make that labor management software business its own company since it’s the only part of the portfolio that’s likely to generate acquisition interest down the road. We estimate GE has fallen several positions since their post-IDX peak. They even sold their RX system back to BDM in March! Is it the start of a second retreat from the HIS biz? It’s the wind-down of this week’s “Wish I’d Known” question, so answer now and you’ll see your comments in this weekend’s recap. Welltok raises $75 million in a second Series E round, bringing its total to $252 million. 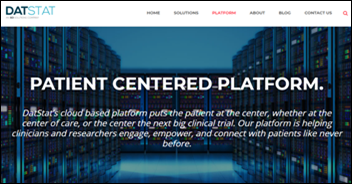 Care coordination software company SCI Solutions acquires patient engagement vendor DatStat for an undisclosed sum. SCI acquired competitor Clarity Health Services in 2015. 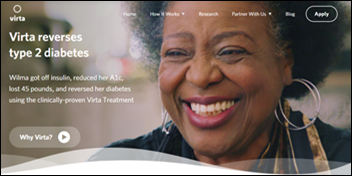 Virta raises $45 million in a Series B funding round. The San Francisco-based company has developed a clinical treatment and continuous remote monitoring technology for the prevention and reversal of type 2 diabetes. Microsoft assures customers it will not engage in joint technology ventures with them and then set up competing businesses. It cites as an example 365mc Hospital in South Korea, which has partnered with Microsoft to develop motion-tracking AI software to improve surgeon performance. A newly filed Allscripts 8-K SEC form seems to say that Netsmart will acquire Barista Operations from Change Healthcare for $168 million. I take to mean the former McKesson Homecare software system that was sent to Change Healthcare as part of McKesson’s technology business. Diameter Health hires Kim Howland (Omnicell) as chief product officer. Digital therapy vendor Vida Health hires Randy Forman (Livongo Health) as chief commercial officer. 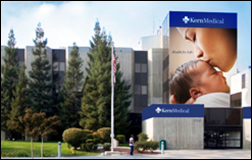 Kern Medical (CA) chooses Cerner Millennium and HealtheIntent. I assume they are replacing Medsphere OpenVista. Mercy Technology Services launches a VMware-powered healthcare cloud for hosting EHRs, imaging systems, and office applications. Veterans groups voice their lack of confidence in acting VA Secretary Robert Wilkie and his ability to keep the yet-to-be signed Cerner contract on track. 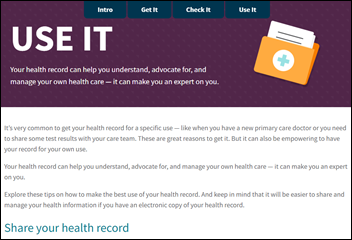 ONC publishes a consumer-friendly guide to obtaining and using digital health records. Virtua Medical Group (NJ) will pay $418,000 to settle allegations that it exposed medical records of 1,650 patients. 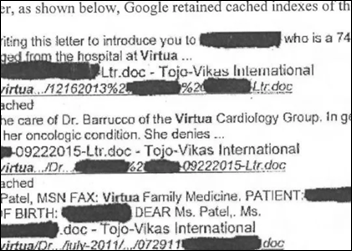 Discovered during a patient’s Google search, the exposure occurred when the group’s transcription company, Best Medical Transcription, misconfigured its server, allowing the records to be accessed via FTP site without a password. A NEJM op-ed piece says we may be approaching the limits of how much impact changes in process, culture, and narrowly-focused technology can have on patient harm, suggesting that AI-powered computer vision – such as that used in Google’s experiments with self-driving cars – could improve the screening of medical images, evaluate patient mobility, and monitor handwashing compliance. 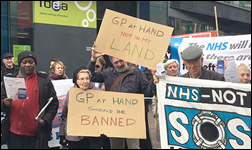 GPs in London protest NHS England’s decision last fall to offer patients text-based care via the Babylon Health-powered GP at Hand app, the use of which automatically de-registered users from their local NHS surgery. Patients are now attempting to re-register, creating extra work for clinicians who also feel the app “cherry picks” healthier, less-costly patients. Babylon Health, meanwhile, has signed a deal with Chinese Internet technology vendor Tencent to incorporate its virtual care tools into WeChat, a social messaging app with 1 billion users. CoverMyMeds partners with McKesson Specialty Health to develop ExpressCoverage prior authorization and medication management services. EClinicalWorks will exhibit at ASCA 2018 April 11-13 in Boston. PatientSafe Solutions will deliver infectious disease alerts from its integration with the technology of Merck subsidiary Ilum Health Solutions. Healthgrades partners with other Denver tech companies to launch the Colorado Technology Recruiting Coalition. Healthwise will exhibit at the EClinicalWorks Innovation Summit for Enterprise and Urgent Care Customers April 9-11 in Fort Lauderdale, FL. Paula Anthony joins Huntzinger Management Group affiliate Next Wave Health Advisors. InstaMed’s External Payment Page Integration is now available in the Epic App Orchard. InterSystems and Intelligent Medical Objects will exhibit at NetSmart Connections 2018 April 8-11 in Phoenix. Mr. HIStalk, This senior HIT professional remains amazed how you are able to track the relatively recent (i.e., last ~15 years) ancestry of the plethora of HIT products. Quite an accomplishment considering the tornado-like buying/selling/merging/acquiring/dropping product activity during these years. Good job! But Woodstock, ever stop to think that Mr. Histalk has probably had touches with a large percentage of these older firms as part of his job? I would guess that not all of those encounters made his life easier and he probably has the singed finger tips to prove it. I agree with you, his knowledge base nevertheless is impressive. I too was a part of that mid-80s to 2000 set of HIS solutions, and it was amazing what they did with quite poor technology as compared to today. We used to joke in the early 2000’s that we were actively trying to drag them kicking and screaming into the 1990’s. While healthcare is much more complex than banking, the bankers had their game together very much earlier. I could travel 2000 miles and withdraw cash from my bank account in 1990. I would still have problems today to give a doctor 2000 miles away ANY electronic access to my medical records. No mention what will happen to the IT segment of Datex-Ohmeda – their AIMS – Anesthesia Info Management System – which is installed at ?? sites around the globe. Is Datex-Ohmeda also divested ? I once had the pleasure to work with the Helsinki-based Datex-Ohmeda. Met several acquaintances years later in USA (after GE acquired them) – and they complained bitterly about the slow, painful process of GE digesting them…. About 10 years before the GE/Loral deal in 1997 GE and IBM partnered to bring to market a PACS called Integrated Diagnostics (ID). It was “somewhat less than a market success” and both companies pulled the plug on it shortly thereafter, Of courtse many companies were doing the same two step tango including Philips with its relationship with AT&T for CommView. After the ID fiasco IBM partnered with an Orlando Florida firm, Geneys, to market an RS-6000 based product which GE also had the rights to market but (smartly) elected not to taking turns on the dance floor with whomever would dance with them, They didn’t choose Loral as a twos step partner until a lot later down the pike. 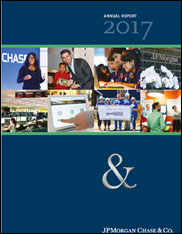 Not surprised GE sold off the Value-Based Care (VBC) division. Jon Zimmerman has run that business into the ground. Totally underfunded from an R&D perspective, i question if Jon really understands the business he’s in. Not to mention he has a bunch of GE-lifers working under him with highly limited non-GE experience, much less an understanding of competing in the 21st century. Good riddance! !